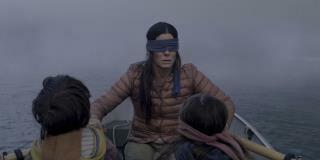 (Newser) – In Bird Box, Netflix's hit horror flick starring Sandra Bullock, characters are forced to navigate through the movie while blindfolded so they don't catch a glimpse of monsters that have the power to kill them via that glimpse. USA Today reports on a teen in Utah who was apparently inspired by the film, and her actions ended in what the Layton Police Department called a "predictable result." Police Lt. Travis Lyman tells the Deseret News the 17-year-old was cruising along a local parkway around 5pm Monday when she decided to take the "Bird Box Challenge" and pull her beanie hat over her eyes to see how she'd do while still behind the wheel. Add to the prank so many others of the same years engage in, jumping off low buildings and trying to land on their feet. or the "Fire Dare", where they douse themselves with accelerant then set fire to themselves and see how long they can hold out before they have to try to put the fire out. Or the "Cinnamon Challege", where they swallow a heaping tablespoon of powdered cinnamon, even though that could be deadly. Or the dare of sticking their tongue or fingers in a rat trap and let it snap shut. Or, for that matter, such things as engaging in drug use. These qualify as Democratic Rackets voters.